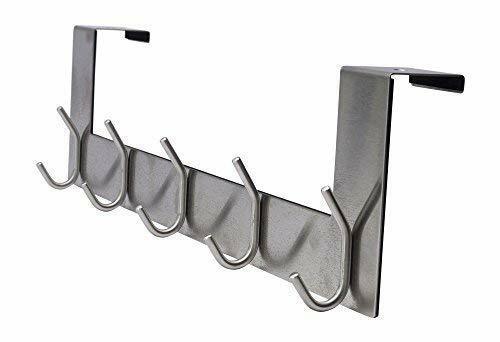 This over the door 5 hook storage rack is 15 1/2" wide and will fit over all standard doors up to 1 1/2" thick. Please measure your door thickness before ordering. Organize your life with these easy to install over the door hooks which involves zero use of power tools. Get rid of the clutter and manage unused space in your home adding instant storage with this Classic Over the Door 5 Hook Organizer Rack. This is an essential product for anyone who doesn't want to deal with having to use power tools to drill holes all over your home in order to get some hooks installed. You can use these hooks to organize your laundry, separate whites and colored for easy organization. Or pick your winter coats off the floor and tidy them away behind the closet door. These hooks are very durable and can be used to organize your most used items such as scarves, coats, and hats. You can even hang your handbags, keys and umbrella for quick access near the front door. OVER THE DOOR STORAGE are ready for use and you don't need to pay for installation OVER DOOR HANGER is an essential for anyone who doesn't want to deal with the hassle of drilling HOOK RACK keeps any room neat and organized by providing extra hanging storage in your home OVER THE DOOR RACK is perfect for anyone who needs more hanging space in their home or office OVER THE DOOR COAT RACK allow you to remove all the unwanted and bulgy clutter from your home You can also use these hooks to give yourself more room around the house. DOOR HANGERS are ideal for bedroom and bedroom closets for purses, clothes, jackets, towels and more. Get rid of that pile of stuff which is cluttering your home. This versatile product can also be used to hang towels in the bathroom to help them air dry and preserve precious space. Instead of thinking about ways to get your items organized, you just need our over the door hooks. It is the best way to insure a long lasting solution to everyone's organization problem.